If you want to make a small change to your contract clauses, but don't want to create an entirely new contract template, use contract specific clauses. Go to the contract page and scroll down to the Contract-specific clauses section. Click to add a clause, fill in the form, then click Save. Edit the clause in-line once you’ve saved. To add all the clauses from a template, and then be able to edit them, click the duplicate icon next to the plus button. Choose a contract template which will be your starting point. Click Copy the chosen template’s clauses to this contract and, when the page refreshes, edit them. Edits only affect the contract you are editing – not the contract template. Mix and match template and contract-specific clauses. 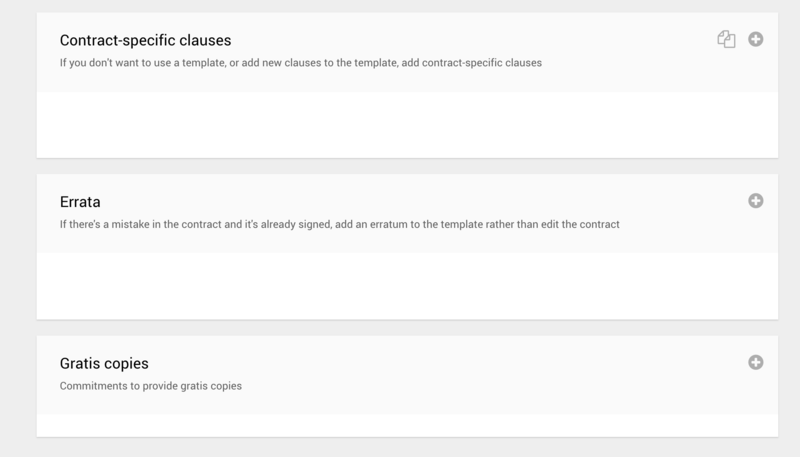 Choose a contract template at the top of the contract edit page, and also have some contract specific clauses. Both appear on the PDF. Control what gets printed on the PDF using the fields at the top of the page in the Contract formatting section.